By Antara Dasgupta in EPF on October 26, 2017 . PF (Provident Fund) is something the salaried employees are well aware of. It is basically a retirement savings plan where a minor portion of the salary is deducted from your salary account and deposited to your PF account which is very handy in future at the time of emergencies. Once enrolled in the scheme you should keep a track of your deposits. And EPFO (Employees Provident Fund Organization) provides the facility to check EPF balance online which is very easy and convenient. The facility of checking EPF balance was launched in August 2011. The idea behind introducing an online method is to give employees quick access to information related to their PF account balance. To check your EPF balance visit the official web page of EPFO and on the top right corner of the home page look for e – passbook and click on the link. After clicking on the link, you will be directed to a page where you are required to enter your UAN (Universal Account Number) and password (UAN number is allotted to every subscribers of EPF account which works as an umbrella for the multiple Member Ids allotted to the same individual). Once you provide your UAN number and password, you can check your EPF balance online. Also note that EPFO have introduced m – EPF app through which the subscribers can quickly check their passbook / balances. Download the app and on the front page look for “Member” option. And you are required to click on the option in order to check your Balance / Passbook. Also, EPFO is constantly striving to make the scheme more convenient to the subscribers. The organization decided to provide payments through an electronic or digital fund transfer system for a quick transfer of funds and also for easier tracking and reconciliation. Under the “Our Services” Section, click on “For Employees“. A new page will open up, on that page scroll down Under the “Services” section look for “Know your claim status” and click on it. On Clicking, you will be redirected to a new page on that page you will be asked to enter the UAN Number associated with your EPF Account and security captcha. 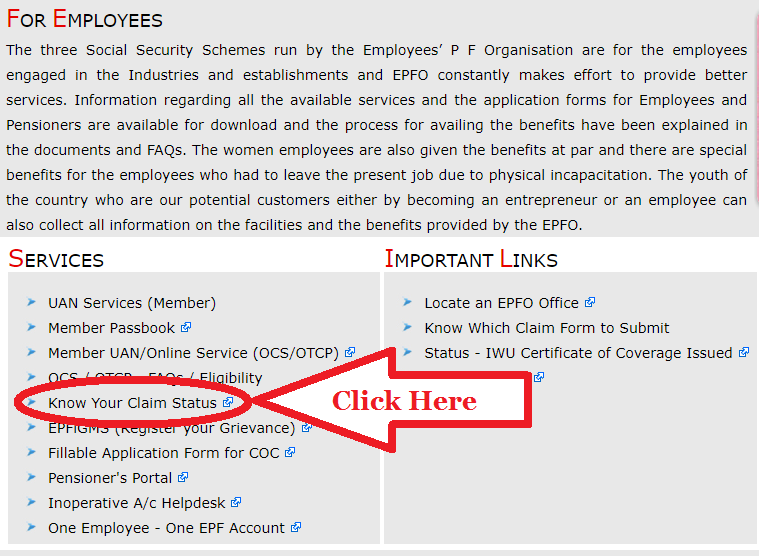 After entering the details asked click on “Search” button and your EPF Claim status will be displayed to you. If some details entered are incorrect or some mistake has been done you can click on “Reset” button and Enter correct details again.